In our previous discussion we go through 'What is spring security' and 'Spring Security Example'. In this particular blog we will dive into how to set a custom login form in spring security application. Spring security provides an in-build login form if we does not provide a user defined form, but in real world applications we need to add spring security form login capabilities in our own designed login forms. 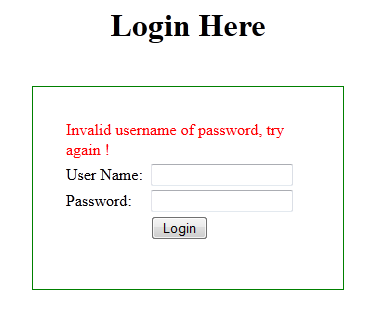 In this blog we will create a custom login form to make user enter their credential, those username and password will be that authenticated by spring security and required page will be displayed to the loggeedin user. We need to configure few attributes in spring-config file to make it possible to set custom login form, default landing page and logout functionality. 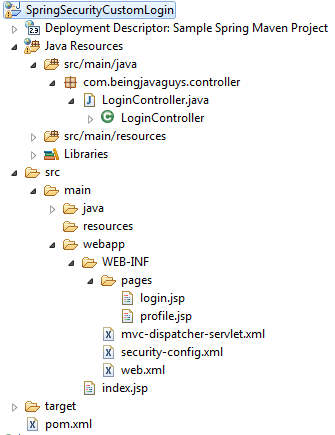 Let us first start with our maven project structure, and will go through all required configuration files one by one. See the rest part of this blog for detailed information on each step. Here is a list of all required dependencies that we need to add in pom.xml, to get spring security basic features all we need to do is to add 'spring-security-web' and 'spring-security-config' to pm.xml file. The very first thing we need to do is adding following filters to our web.xml. These filters tells the container that all upcoming requests will be handled by spring security for security purpose. DelegatingFilterProxy is a class present in spring-security jars which delegates control to a filter chaining defined in spring-security internals. Note that we have given the bean name as ?springSecurityFilterChain? one should not change the name of this bean as this is being configured by spring-security internal infrastructure. By adding these filters to web.xml now we are ready to configure security in the application. This is a simple spring configuration file with a view resolver bean to show jsp's and two useful annotation information regarding component-scan and annotation-driven. By adding filter to web.xml we are now able to configure security in our application, we can start with minimal http configuration for incoming requests. This tells that all upcoming requests which are matching to the pattern given in ?pattern? attribute will be secured bu spring-security and these requests will need ?ROLE_USER? role to access them. Here the thing to be noted is that ?ROLE_? prefix is a marker to define roles, ?access? attribute can accept a number of roles separated by a comma. Regarding ? ? we can have a number of different entries for different url?s, these entries will be evaluated in the order they are defined here. The very first match to the incoming request will be executed. We can also add a method attribute to limit the match to a particular HTTP method (GET, POST, PUT etc.). This is a simple Controller class with few request mappings in it, we have '/login' to redirect the user to login form along with custom messages if required. Another mapping id for profile page '/profile' only logged in users will be able to see 'profile' page. 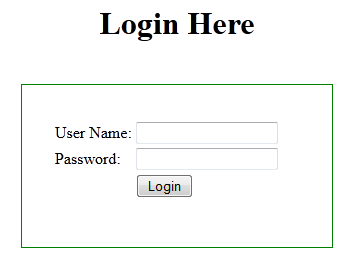 This is actual custom login form that will be rendered to the user to add credentials and log in to the application. In this file all we need to do is adding spring specific action 'j_spring_security_check' so that spring-security can intercept it and can authentication done. This is another simple jsp file, this will be rendered to the browser if the user is logged in successfully. We have also added a logout link in the page, logout functionality to work onw has to make the spring specific link '/j_spring_security_logout'. By clicking the link spring-security will logged out the current logged in used. Here we are done with all required configurations, if everything goes right you will see following screens in your browser. We have intercepted "/profile" url in 'spring-config'. Go to the browser and hit 'http://localhost:8080/SpringSecurityCustomLogin/profile'. We have intercepted '/profile' so spring-security will redirect the page to 'http://localhost:8080/SpringSecurityCustomLogin/login' and you will see following custom login screen. Enter username as 'user' and password as 'user@123' and hit login, you will see the profile page as shown below. Now hit 'logout' and you will be redirected to the login screen again showing a logged out success message. In case you entered wrong username or password, you will be redirected to login form page along with wrong credential message as shown below. This is all about setting custom login form in spring security. In upcoming blogs we will see more about Spring, Hibernate, Java and Other opensource technologies. Download "Spring Security Custom Login Form Example Project" from "SkyDrive"